Das Hôtel de Ville ist das in der zweiten Hälfte des 19. Jahrhunderts im Stil der Neorenaissance errichtete Rathaus von Paris. Das gegenwärtige Gebäude mit 146 Statuen an der Fassade wurde in den Jahren 1874–1882 gebaut. Es wurde von den Architekten Théodore Ballu (1817–1885) und Pierre Deperthes (1833–1898) entworfen. The Hôtel de Ville in Paris, France, is the building housing the city's local administration. It was built from 1873 through 1892 (19 years) by the architects Théodore Ballu and Édouard Deperthes. 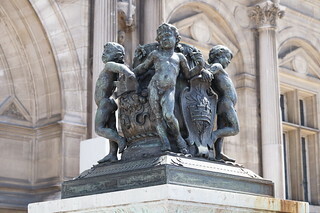 The central ceremonial doors under the clock are flanked by allegorical figures of Art, by Laurent Marqueste, and Science, by Jules Blanchard. Some 230 other sculptors were commissioned to produce 338 individual figures of famous Parisians on each facade, along with lions and other sculptural features. The sculptors included prominent academicians like Ernest-Eugène Hiolle and Henri Chapu, but easily the most famous was Auguste Rodin. Rodin produced the figure of the 18th-century mathematician Jean le Rond d'Alembert, finished in 1882.